The forecast for 2016 seems to be wild, unpredictable weather and a deluge of small-form-factor PCs. This is the year in which compact systems are expected to hit their stride, and even at this early stage we've already seen new NUCs, the emergence of a mini-STX form factor, fanless desktops, itsy-bitsy graphics cards and super-slim chassis. System integrators and DIY enthusiasts will be observing the onslaught of small enclosures with interest, and Fractal Design is looking to catch your attention with the Define Nano S. Announced just last week ahead of retail availability in March, the Nano S is the latest addition to Fractal's award-winning Define Series range of enclosures and, for a mere £50, is said to deliver "the perfect balance between silent and minimalistic Scandinavian design." Look familiar? Wondering where you might have seen this case before? You're probably thinking of last year's mid-tower Define S, as the Nano is essentially a shrunken variant. Not that we're complaining, mind. The Define S was a solid and sleek case, and the smaller Nano brings a level of cuteness to the table. However it's not the cute design that first springs to mind, but rather the surprising size of the case. For a mini-ITX solution, Nano S isn't actually that small. 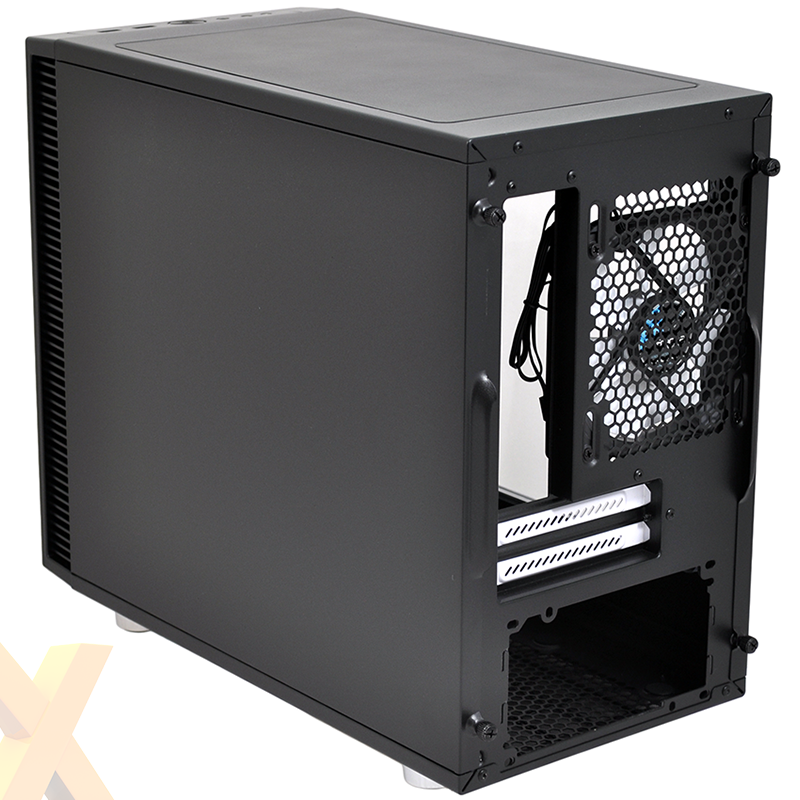 The chassis measures 203mm (W) x 344mm (H) x 412mm (D) in size, making it barely any smaller than Fractal's own Core 1000, which can support a choice of mini-ITX or micro-ATX boards. 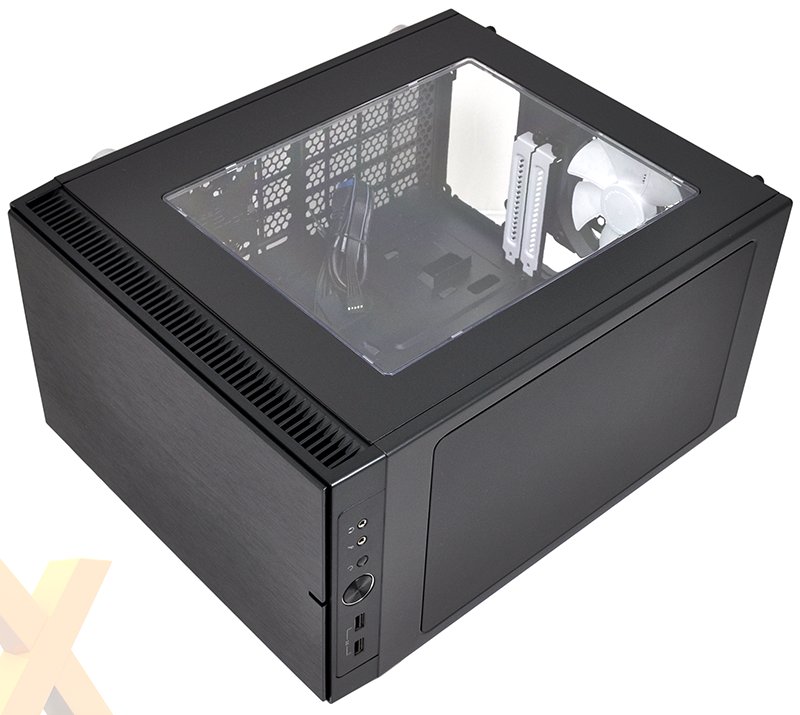 It's an important point to make, as unlike many other ITX enclosures, the Nano S isn't designed to be as small as possible. According to Fractal, "the decision was made that we would focus on maximizing the feature set to allow for bigger graphics cards, water cooling compatibility and ATX PSU, instead of minimizing the size and therefore the overall component compatibility." 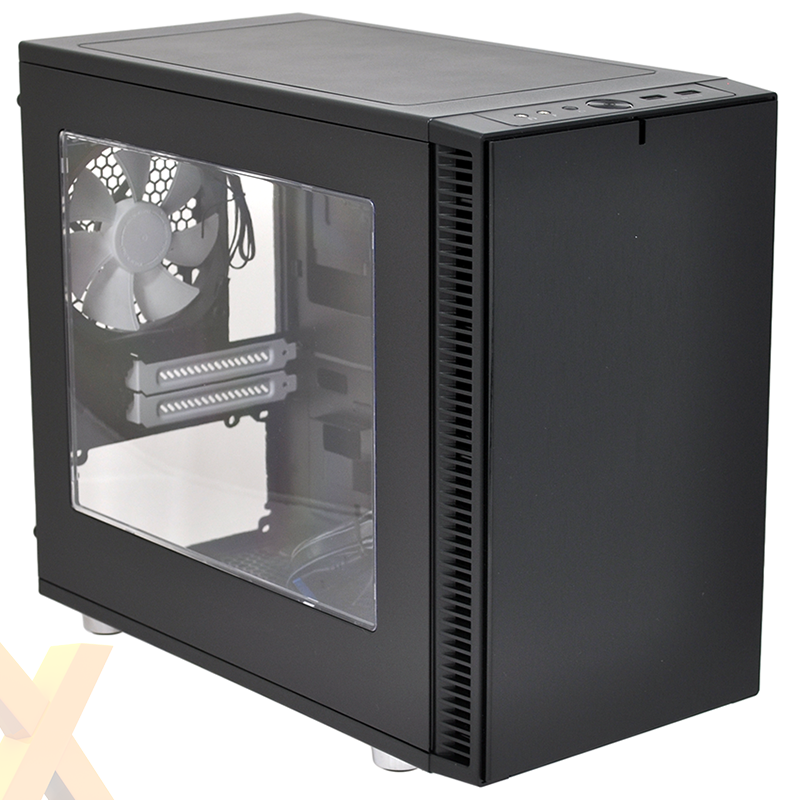 The decision not to focus on ultra-compact design is an interesting yet unusual choice for an ITX case, and one that leaves the Nano S targeting a niche audience. In order for this enclosure to make sense for a prospective build, you need to be considering a high-performance rig that marries a mini-ITX motherboard to a couple of full-size components and, preferably, a lot of liquid-cooling gear. And high-end gear really is the order of the day. 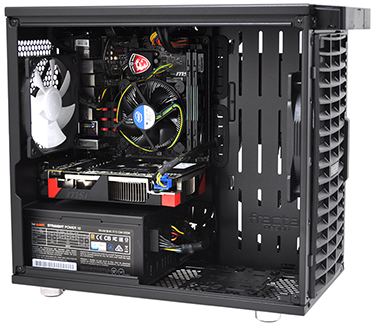 In many ways, a mini-ITX motherboard is made to feel insignificant inside the Nano S's relatively cavernous interior. 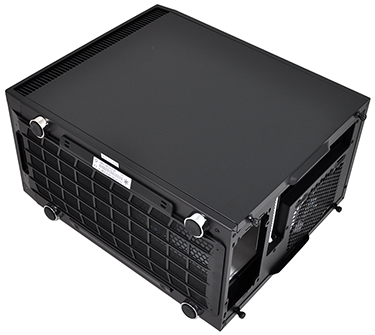 Surrounding the top-left motherboard tray is a bottom-mounted PSU bay capable of housing a supply measuring up to 160mm deep, two expansion slots supporting a graphics card of up to 315mm in length, as well as half-a-dozen fan-mount positions. You could, if you so wanted, install dual 140s in the front, dual 140s up top, a 120 at the back and a 120 on the base. A 140 intake and 120 exhaust are included as standard, though both are of the standard three-pin variety, as opposed to the preferred PWM. Fractal does, however, include a Y-splitter cable in the bundle, which is handy as mini-ITX boards tend not to have a great number of available headers. Nano S has a good-looking interior, and the side window does a great job of showing it off, yet it's clear that some form of liquid cooling is going to be needed to fill the available space. The front half of the case is dedicated almost exclusively to such hardware, with Fractal implementing multiple pre-drilled slots for installing a reservoir. On the base, alongside the PSU bay, is a bracket for attaching a DDC or D5 pump. 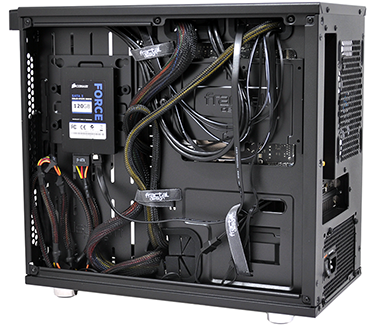 The aforementioned bracket can be used to mount another hard disk or SSD, but liquid cooling is the focus. As such, there's room for a radiator in the front (up to 280mm), a radiator up top (up to 240mm) and another radiator at the rear (up to 120mm). That's a heck of a lot of cooling potential for a mini-ITX build, yet if that's the path you choose to take, Fractal's implementation works well. Elsewhere, provisions have been made for up to four internal storage devices - one on the base of the interior, and three behind the motherboard tray. All four mounts can be used to house a 2.5in SSD, but only two support 3.5in hard disks, none are tool-free and there's no love for 5.25in optical drives. Novelties or added extras are few and far between. In a nutshell, Nano S is a larger-than-usual mini-ITX case geared toward high-end liquid cooling. There are however a couple of Fractal Design niceties included as standard. The front and solid side panels are lined with sound-deadening material, as is the top modu-vent cover, and the trio of Velcro straps behind the motherboard tray is a small-but-meaningful addition. 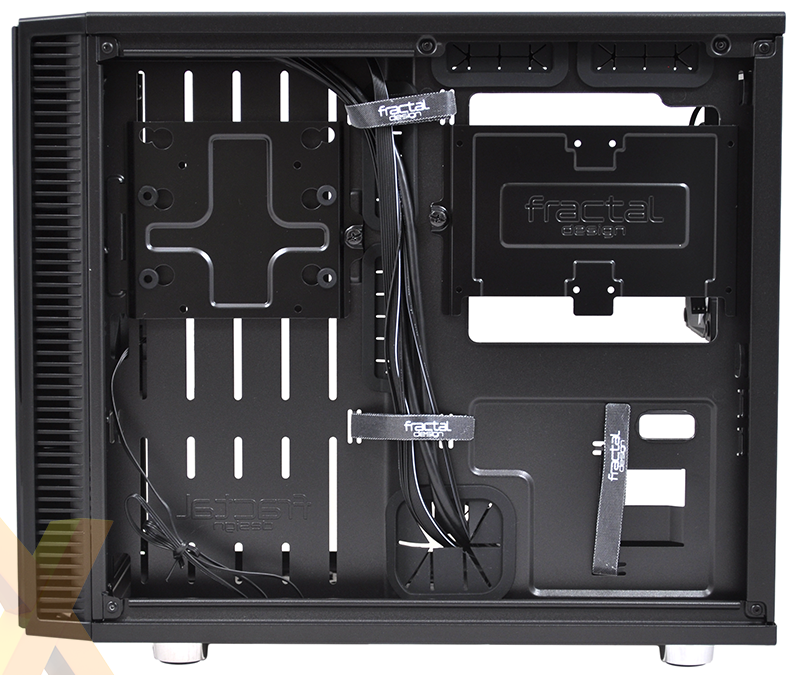 There's a good amount of space for storing excess cabling, and the hinged, thumb-screwed side panels are easy to attach with minimal fuss. A full-size filter underneath the case pulls out for simple maintenance, though it's a shame the same can't be said for the front filter, which can only be accessed by removing the plastic fascia. 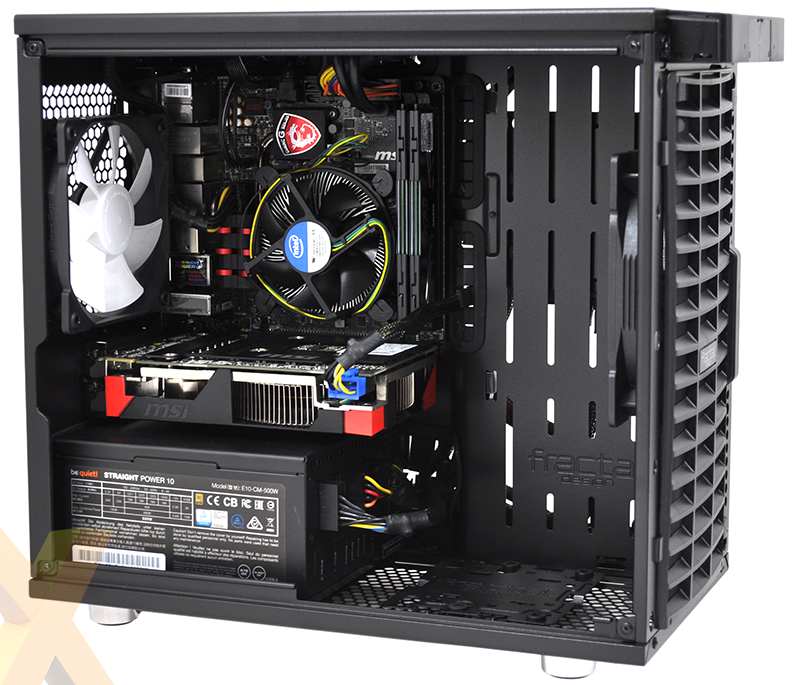 Our mini-ITX test platform is comprised of an MSI Z97I Gaming AC motherboard, 16GB of Adata XPG DDR3 memory, an MSI Radeon R9 270X Gaming 2G ITX graphics card, a Corsair Force 120 SSD and a be quiet! 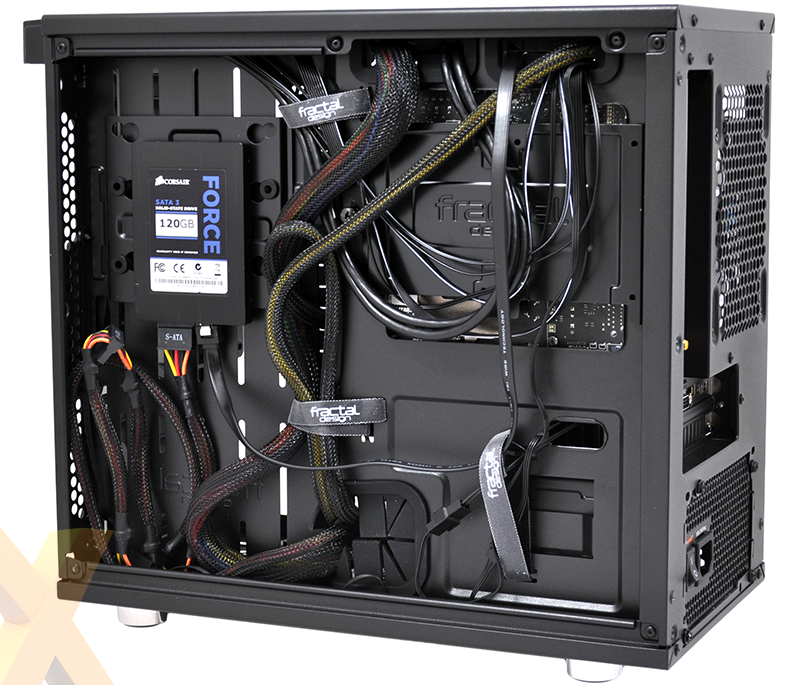 Straight Power 10 PSU. 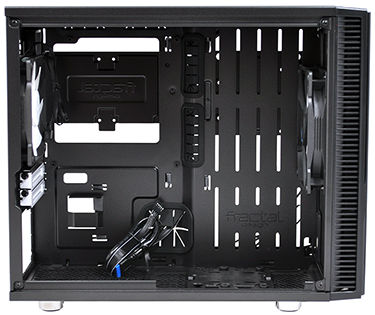 All of the components went in with ease, yet our mini-ITX kit looks somewhat odd in the Nano S's roomy interior. And the graphics card is awfully close to the PSU, so we're intrigued to see how that might affect performance.